Have you ever tried to search for something, only to find your search results inundated with another, rather common name or phrase? Whilst researching the family name of AULD, invariably the top search results that come up is "Auld Lang Syne"! Searching Trove for newspaper articles is no different...but how do you remove these unwanted words/phrases from your results? Scottish poet Robert Byrnes is attributed with writing the poem in 1788. The National Library of Scotland has a digitised copy of Auld Lang Syne available to view online which was printed between 1787 and 1803 in the James Johnson's Scots Musical Museum. When did it all start in Australia? 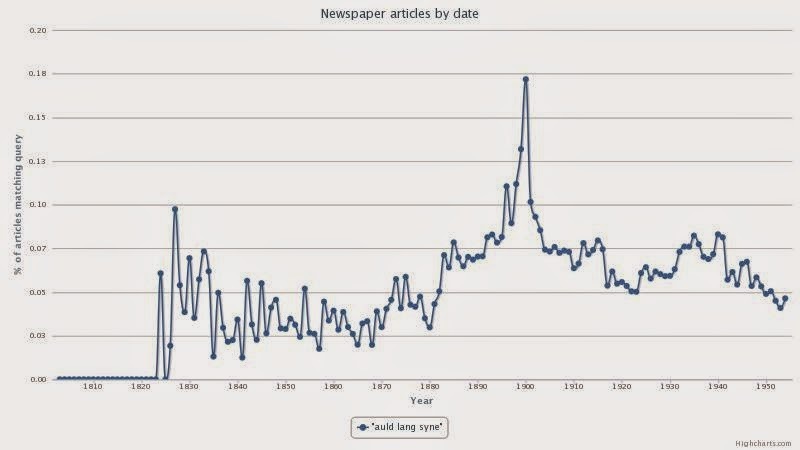 Looking at the total number of articles per year containing the phrase, the above graph highlights the year 1900 (as mentioned above in the proportions graph), but also highlights in the second peak the year 1915. 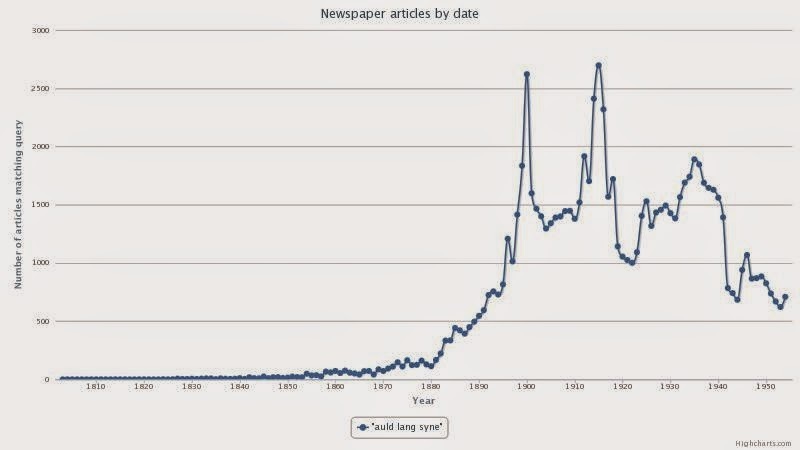 In this year, a total of 2,696 articles contained the phrase, with the year on either side also recording above 2,300 articles. It should also be noted that these results are based on the "Auld Lang Syne" phrase that has been successfully converted and/or corrected to text from the printed material in the Trove database. Results do not include the phrase if it has been incorrectly converted to text by Optical Character Recognition (OCR) software and has not been successfully corrected yet by volunteers/users. auld NOT "Auld Lang Syne"